As admitted in the defendant’s guilty plea, between June and November 2015, PETTUS placed more than 200 calls to a shipping company whose services were used by multiple luxury goods companies, and falsely claimed to be an employee of the luxury goods companies. The defendant typically placed the calls after hours and at times when inquiries were generally handled by overseas customer service centers. While impersonating an employee, PETTUS typically claimed that there were issues with a particular shipment — such as a manifest error, a problematic loading dock, or storefront construction — and requested that the affected packages be held until a third-party courier was able to pick up and reship the merchandise to various drop locations in the San Francisco area. PETTUS would then intercept and acquire the merchandise. Over the course of four months, PETTUS – using more than a dozen aliases and ten different cell phone numbers – diverted and stole dozens of shipments of high-end clothing, shoes, accessories, watches, and other goods valued at more than $400,000 using variations of this scheme. Among other items, the defendant stole Roberto Coin jewelry; dozens of Chanel suits, shoes, watches, wallets, and handbags; and two Patek Phillipe watches — each valued at more than $20,000. Assistant District Attorney James Vinocur handled the prosecution of the case, under the supervision of Jeremy Glickman, Deputy Bureau Chief of the Cybercrime and Identity Theft Bureau, Assistant District Attorney Brenda Fischer, Chief of the Cybercrime and Identity Theft Bureau, and Executive Assistant District Attorney David Szuchman, Chief of the Investigation Division. Senior Cybercrime Analyst Gina Gargano, Cybercrime Analyst Daniela Damti, and Senior Cell Site Analyst Tanya de Vulpillieres provided additional assistance with the investigation. 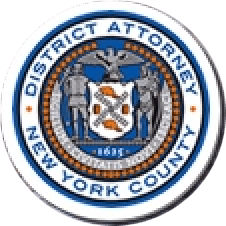 Investigators Max Adler, Reginald Barometre, and Supervising Investigator Robert Muldoon of the Manhattan District Attorney’s Office’s Investigation Division also assisted with the investigation. District Attorney Vance thanked the New York City Police Department, particularly Detectives Armando Coutinho and Kevin Woods of the Financial Cyber Crimes Task Force and the Walnut Creek (California) Police Department, particularly Detective Holley Connors. • Grand Larceny in the Second Degree, a class C felony, 2 counts. • Scheme to Defraud in the First Degree, a class E felony, 1 count. • Criminal Impersonation in the Second Degree, a class A misdemeanor, 1 count.